While Lord Sri Caitanya Mahaprabhu was traveling in South India, he met a brahmana who invited the Lord to his home. This brahmana was a scholarly devotee and an authority on Ramayana. He was always detached from material activities. Sri Caitanya Mahaprabhu took his noon bath in the river Kritamala and went to the brahmana’s house for lunch. But He saw that the brahmana had not cooked anything. The brahmana said that since he was living in the forest, it was difficult to procure all the ingredients necessary for cooking a nice meal. In times long past, when Laksmana had brought all the vegetables, fruits and roots from the forest, Sita Devi used to do the necessary cooking. Sri Caitanya Mahaprabhu was visibly pleased with the brahmana’s reply and he relished this mood. 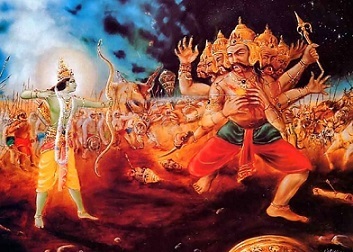 That day the brahmana did not eat at all and when asked as to the reason for his fasting he replied that because Ravana had kidnapped Sita he was morose. In fact, he had even lost the desire to live any longer. After His victory over Ravana, Hanuman and other monkey warriors fetched Sita from Lanka. As she was brought in the presence of Lord Rama, He started to verbally abuse her and everyone present was shocked. She requested Laksmana to make a pyre and said that if she must have thought about any other person except her Lord Rama, then let fire consume her. So saying, she entered the pyre. But the fire god Agni brought her out unscathed. What really happened was that the eternal form of Sita was with Agni who presented her to Lord Rama. And in the fire the material form was consumed. Thus Ravana was “royally” cheated of his designs to enjoy the internal potency (goddess of fortune) of the Supreme Lord and this will also be the fate of anyone following in the footsteps of Ravana.